March 8, is International Women’s Day, and in collaboration with the lovely ladies at Dolce Vita Bloggers, our appropriate topic for this month is “Inspirational Women”. Audrey Hepburn, was a unique individual I admired and adored my entire life. A gentle yet strong-willed woman, who always put others first, inspired me for as long as I can remember. She emerged from an arduous adolescence, suffering the consequences of World War II. As the war ended, she and her mother moved to London, where a dedicated Audrey studied ballet, thereupon gaining a lead role in a production, and the rest we can say, was history! Her successful acting career, captivated the hearts of many worldwide. As a result, Audrey won the Best Actress Oscar at the 1954 Academy Awards in “Roman Holiday.. Audrey was blessed with an award-winning career and family life. After two marriages and two beautiful sons, she continued to be the epitome of style for the fashion-conscious woman. 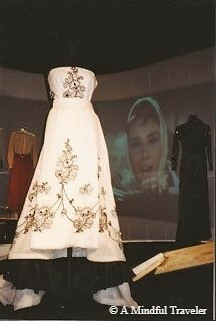 The iconic “little black dress” worn in “Sabrina” and “Breakfast at Tiffany’s,” became the most influential piece of clothing to the modern woman’s wardrobe. Later on, her compassion drove her to become a special goodwill ambassador for UNICEF, where she tirelessly travelled the world connecting with, and assisting countless impoverished children. 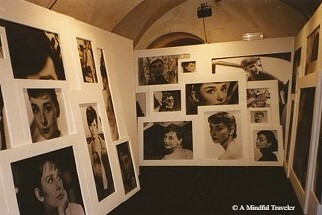 Eighteen years ago, I was fortunate to encounter an exhibition devoted to Audrey Hepburn, in Florence, Italy. 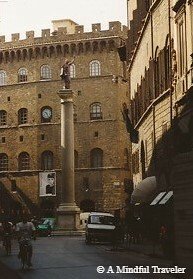 The exhibition was accordingly housed at the Salvatore Ferragamo Museum. Located in the Palazzo Spini Feroni, a medieval palace built in 1289. I remember being so excited to discover a presentation of my beloved icon, within a country I loved. To me, Audrey Hepburn was a true inspiration. Her timeless style, sheer beauty and grace and human compassion, were all traits I admired. She was an influential and inspiring woman, who gave so much love, and in return, was truly grateful for all she had. She was unquestionably in my mind the most beautiful woman ever and that beauty was both inner and outer. Such dignity, such decency such quietly spoken wisdom. Never the shouter, simply doing good and not getting in others way. This is a lovely post – thank you. Audrey Hepburn was undeniably a beautiful and inspiring woman. Lovely tribute to her Lorelle. She was so much more than her beauty or acting talents. Her work with UNICEF isn’t given as much of a spotlight as it should. You picked a winner. One of the best women, indeed! Nice post Lorelle, great to read about such an inspirational actress! She was a great actress as well as activist. I feel it is what happens to us early in life that informs and shapes our lives. This appears to be what happened to Audrey during the war years. She developed a strong connection for those less fortunate and was able to express that bond through her work with UNICEF. She suffered a lot in the early years. I can’t even begin to imagine what she endured, but she rose above and inevitably gave back to the world. Both the famous Hepburn acting ladies create feelings of warm nostalgia. Audrey appeared to be quiet, dignified, and as fragile in body as a porcelain doll. Katherine appeared to be forthright and a little bit out there in her time, also dignified, and had strength seemingly oozing from her pores. I loved them both. Of course I know of Audrey Hepburn but I don’t know anything about her life. This post has inspired me to find out more. Thank you. I know a lot of people who really admire Audrey Hepburn and to be honest I didn’t know much about her. I enjoy her films, but other than that I never really delved deeper into her life. It was interesting to learn a bit more about such an iconic person! Ciao Lorelle! Audrey Hepburn is the perfect combination of strength and grace. It is so admirable that she saw the worst of human nature during the war, yet she still saw the best in others. She is truly an inspiration! 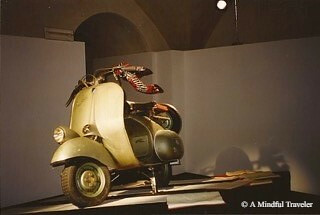 A few years ago they had the scooter from Roman Holiday on display in Pisa and I was so giddy!!! I just couldn’t get over the fact that Audrey herself had touched that scooter!!! Thank you for your kind words Aquileana. I have not read Capote’s book, so I have mentally noted to do so! A wonderful quote by Ms. Hepburn. I enjoyed her hosting episodes of “Gardens of the World” at one time. My favourite woman 🙂 Lovely post Lorelle! I think we should do a survey about how many women/men do not like her. What do you think the result would be? We have only ever seen Breakfast at Tiffany’s once, but have obviously heard so much about Audrey Hepburn. We need to watch more of her movies! She definitely has a very special quality about her to be talked about so highly of to this day. She made her mark with her classic beauty and strength! Great post! Ooh yes I totally agree with this! I love how much personality she has in her films too, she’s really funny and quirky. Shockingly, I still haven’t actually seen Roman Holiday, think that’s this weekend’s film then! Thanks for sharing! I of course know who Audrey Hepburn is but didn’t really know anything about her life. And I still have yet to watch many of her films. Beautiful, inside and out and truly inspirational in what she survived and what drove her on. A great choice to look up to. Talk about a beautiful, classy woman! Really enjoyed reading this! Audrey Hepburn is a true style icon – everything about her, from her fashion sense to her large heart – is iconic! Potentially stupid question, when you say she went to London after the war, was she an American or was she born somewhere else? Great post and what an inspiration! I have always loved photos of her fashion. Oh ok! I honestly thought she was an American. 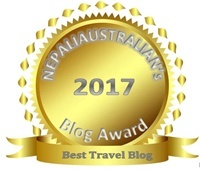 Lovely post – feel I have learnt something! I feel like I should be embarrassed to admit this, but I don’t really know anything about Audrey Hepburn. I think she was an actress in the 50s? 60s? And that’s about it… But after reading your post, I see she did a lot more than just that. Audrey Hepburn, was such a classy icon. Truly one of a kind. No celebrities these days ooze the class of her. This is such a great choice and honestly, was such a pleasure to read. I remember seeing her wax work in London. She was absolutely dainty and tiny. But she had on that famous outfit from Breakfast at Tiffany’s. she actually made me want to smoke as I wanted to emulate that look. Beautiful story… look forward to your future posts. She was one of those people who was beautuful inside and outside. A woman of true style and beauty.